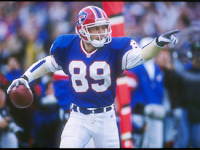 Former Buffalo Bills All-Pro wide receiver Steve Tasker will serve as the Honorary Pace Car Driver for the Go Bowling at The Glen Monster Energy NASCAR Cup Series race, Aug. 5 at Watkins Glen International. Tasker, a 13-year veteran of the Bills, is one of the NFL’s greatest special teams players of all-time. A seven-time selection by his peers and coaches to represent the AFC as the special teams player at the Pro Bowl (1988, 1991-96), he is the only true special teams player to be selected as the Pro Bowl MVP (1993). A five-time All-Pro selection, was a key component of the Bills’ four consecutive AFC Championship teams (1991-94). He finished his career with 51 receptions for 779 yards and nine touchdowns, an average of 21.1 yards per kickoff return and 186 special teams tackles. In August 2000, he was voted by the 36 Pro Football Hall of Fame voters to the NFL’s All-Time team as its special teams player. Tasker was honored as the 24th person enshrined on the Buffalo Bills Wall of Fame on September 9, 2007. Tasker was drafted by the Houston Oilers in the ninth round (226th overall) of the 1985 NFL Draft. He was acquired by Buffalo from Houston in November 1986 after playing for the Oilers for parts of the 1985 and 1986 season.